General Ayurveda body massage for the couple. Houseboat will be stationed at one place from 6:00 pm to 7:00 am due to Govt. restrictions. Welcome to God's Own Country. Upon arrival our representative will greet you at Kochi Airport/ Railway Station and then transfer to the hotel. Check-in and relax for a while amidst the comforts of your room. Later, proceed for a half day city sightseeing tour of Kochi. Kochi which is having the best preserved history of colonial times and the ideal way to bring it alive is to take a walk down memory lane. The major tourist attractions are Chinese Fishing Nets, St. Francis Church, Santa Cruz Basilica, Jewish Synagogue, and Mattancherry Palace/Dutch Palace. Overnight stay at the Hotel/Resort. Enjoy the sumptuous breakfast. Later proceed to Munnar, the place where the unfolded green carpet is waiting for you. Munnar is breathtakingly beautiful, a haven of peace and tranquility - the idyllic tourist destination in God's own country. Munnar is the gateway of Hills in South India. On the way you can also watch the lovely waterfalls in Cheeyappara and colourful flowers in Blossom Garden. Reach & check-in at the hotel and relax for a while amidst the comforts of your room. Explore rest of the day along with the nature. Overnight stay at the Hotel/Resort. Enjoy the sumptuous breakfast. Later proceed to Thekkady which offers diverse attractions like Wildlife Sanctuary, Hill Station and Spice Plantation. Natures own little hideout nestled in the hills of Thekkady. Reach & check-in at the hotel and relax for a while amidst the comforts of your room. Later proceed to Periyar Wild life Sanctuary. The place where one can go for a Wildlife cruise to view a large variety of wildlife like Wild Elephants, Nilgiri Langur, Sambar Deer, Wild Bison, Wild Boar etc, and quite a lot of unique birds can also be spotted. Visit the local spice market for some garden fresh spices and handicrafts. Overnight stay at the Hotel/Resort. Enjoy sumptuous breakfast. Later proceed for the sightseeing. Kumarakom is one of the few places in the world where the means for transportation is through boats. Kumarakom is blessed with the Vembanad Lake which has its majestic canals, streams and distributaries along its banks weave an intricate and enchantingly beautiful web. Check-in and relax for a while amidst the comforts of your room. Explore the rest of the day at your own. Overnight stay at the Hotel/Resort. Have an early wake up to visit Kumarakom Bird sanctuary which lies at the edge of the grounds of an old estate on the banks of Vembanad Lake. This sanctuary is home to many exotic species like darters, egrets, herons, rose-billed roller, kingfishers, woodpeckers, Siberian stork, Ceylon Frogmouth, teals and thousands of other migratory birds. After breakfast, view the scenic picturesque landscapes of Kumarakom. Explore rest of the day at your own leisure. . 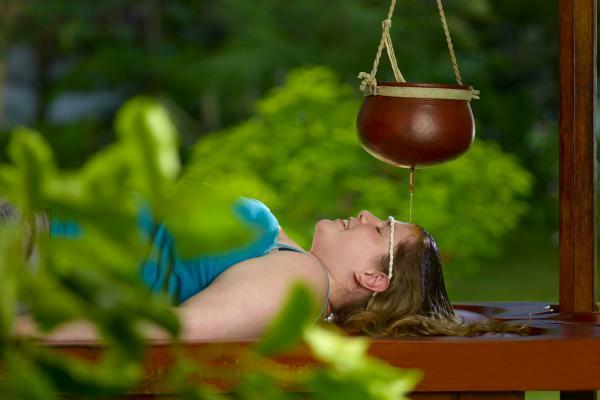 In the evening enjoy the Ayurveda Massage (" abhyangam treatment"). This treatment is used to keep the body balanced, healthy, and focused. The massage involves covering the client in oil and then rubbing the oil smoothly and gently. Overnight stay at the Hotel/Resort. Have an early visit to Kumarakom Bird Sanctuary which lies at the edge of the grounds of an old estate where a profusion of all kinds of birds can be observed. Domestic birds such as cuckoo, wild duck, egrets, darters, herons, teal, and water fowl can be seen in abundance here, as much as can the Siberian storks which migrate to this place each year. Later enjoy the sumptuous breakfast and proceed to the boat Jetty, board the beautifully decorated houseboats and begin the enchanting backwater cruising. The backwaters of Kerala is a unique product of Kerala and is found no where else in the world. A glide in a "Kettuvallam" (Houseboat) through the enchanting backwaters is sure to rob your heart. Sparkling greens, emerald backwaters, coir-laden houseboats and magical beauty heals your mind and body as you travel to surreal Kerala. Overnight stay in the Houseboat. Enjoy the sumptuous breakfast. Later pack your baggages with a promise to return once again to this part of the world.... Proceed on time to board your flight/train with sweet memories of your holidays. We await for your next visit ... Bon Voyage. Service ends.